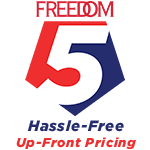 Description Here at Freedom we know your time is extremely valuable, so we shop the surrounding market prices so you don't have to! Priced below KBB Fair Purchase Price! CARFAX One-Owner.